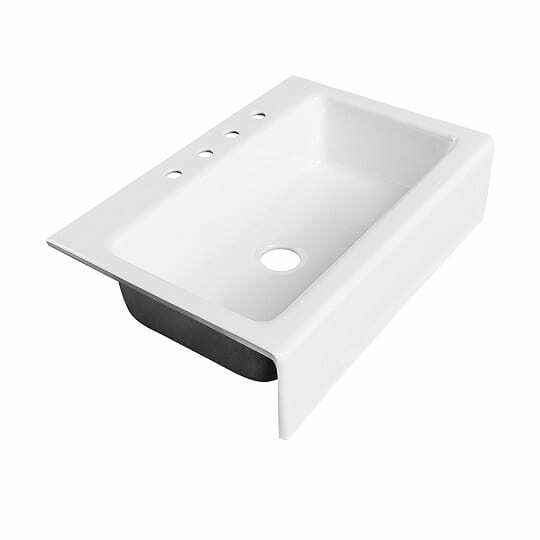 Cast Iron farmhouse sinks, commonly known as cast iron apron-front sinks, have become very popular in recent years. Its unique design, beauty, and functionality have made them wonderful options in any kitchen. Farmhouse sinks started penetrating into the houses of the wealthy, where they were used for cleaning everything from utensils to children. 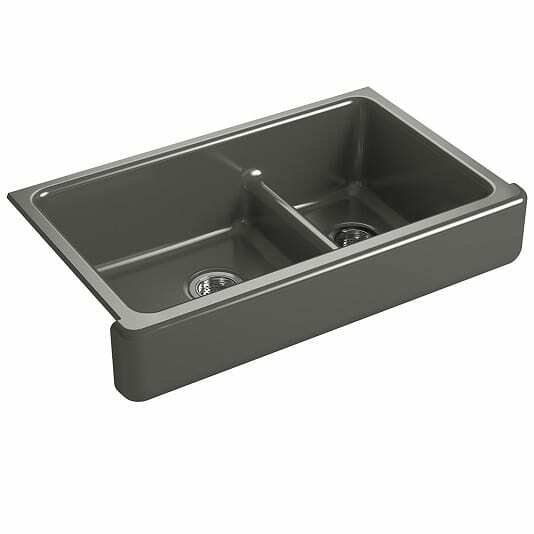 In addition, cleaning large baking sheets and stockpots is much easier in a cast iron farmhouse sink. 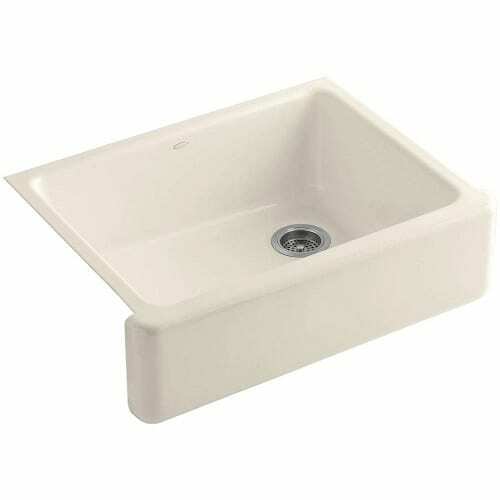 However, the price of these sinks were too high in the past for people to put them in their homes. 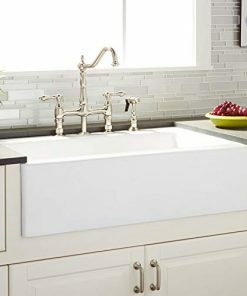 Nowadays, there are much more affordable farmhouse sinks for sale so you don’t have to spend your retirement savings to buy one. 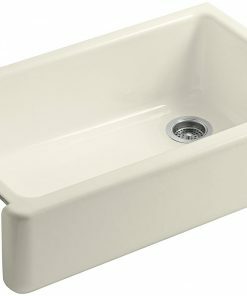 Apron-front sinks mainly work with custom-built cabinetry and counter-tops, but other options can be put in place without necessarily having to replace the existing cabinetry. 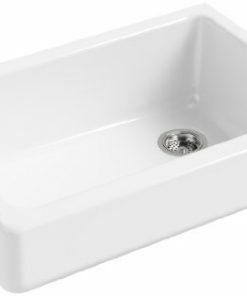 Every question you have about cast iron farmhouse sinks will be answered below. We also have plenty of apron-front cast iron sinks for sale. 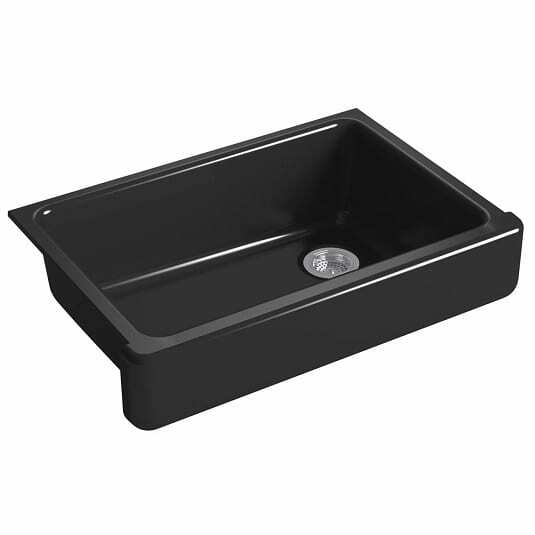 We listed the cast iron farm sinks sorted by size from small to large. 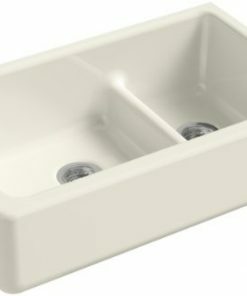 In addition, you will see the brand for each sink and the color. We start with all of our 30″ sinks for sale. 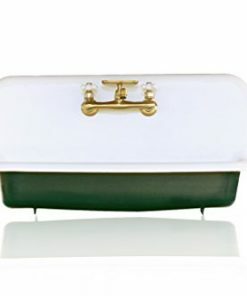 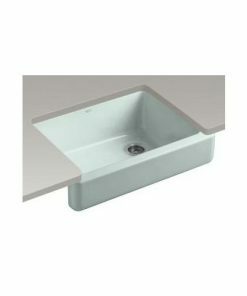 You will find a variety of colors below including almond, white, black, and grey. 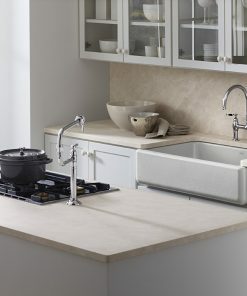 Each of the options available feature an apron-front and they are perfect for your rustic kitchen. 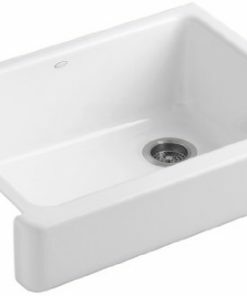 The sink below is what all of the sinks above would look in a kitchen. 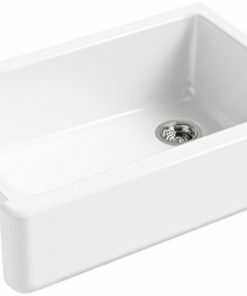 We only have a white 30″ Kohler Whitehaven Cast Iron Farmhouse Sink as our example, but you can see what it might look like in your kitchen. 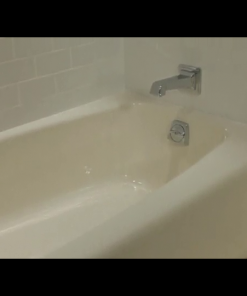 Next, we listed some options for sinks that are 33″ in width. They will fit most cabinets that are 33″ wide and all of the sinks below are made out of cast iron. 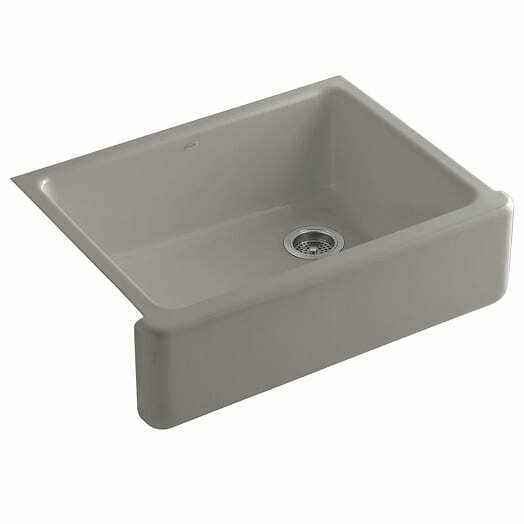 Last and certainly not least, we have our cast iron farmhouse sinks that are sized 36 inches wide. They are all from the brand Kohler and you will find single basin and double farmhouse sinks that are 36″. 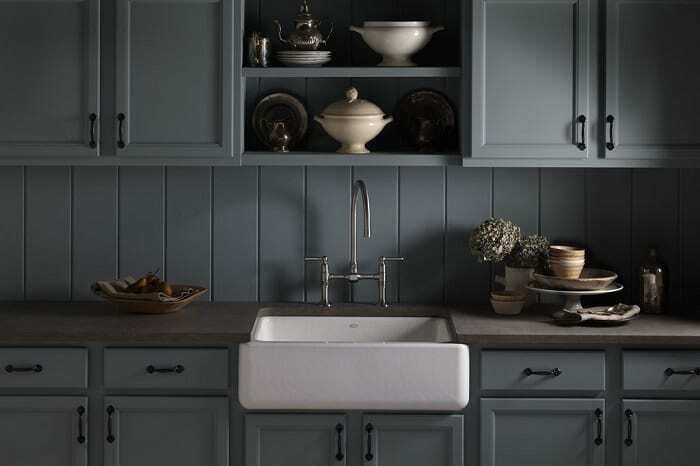 In addition, there are plenty of colors available to fit your kitchen. Cast Iron Farmhouse sinks come in different sizes ranging from 30 inches to 36 inches. 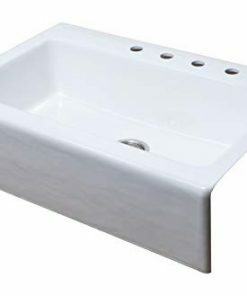 We go through some benefits of each size below. 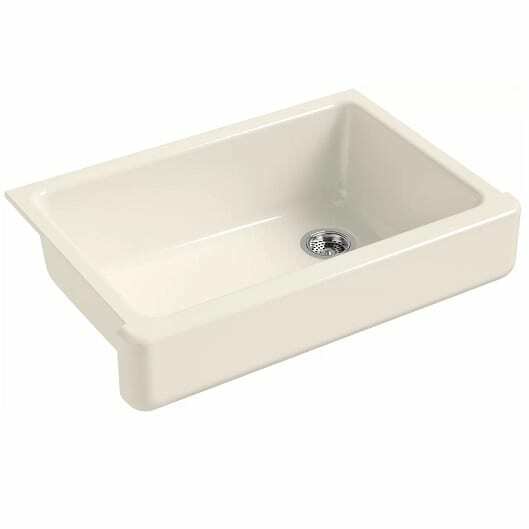 30 inch farmhouse sinks have a short apron-front with very simple installation procedures as one only has to cut the self-trimming design and under-mount it. 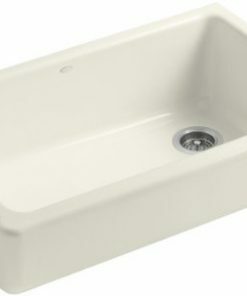 It can also be retrofitted into an existing cabinetry of the same size. 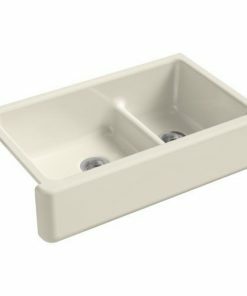 These farmhouse sinks are mainly used for remodeling projects, as they are an assurance of perfect and exquisite results. 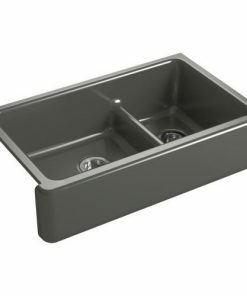 The sink has enough space to accommodate large pans and pots and a bottom that helps in draining water and dirt particles. 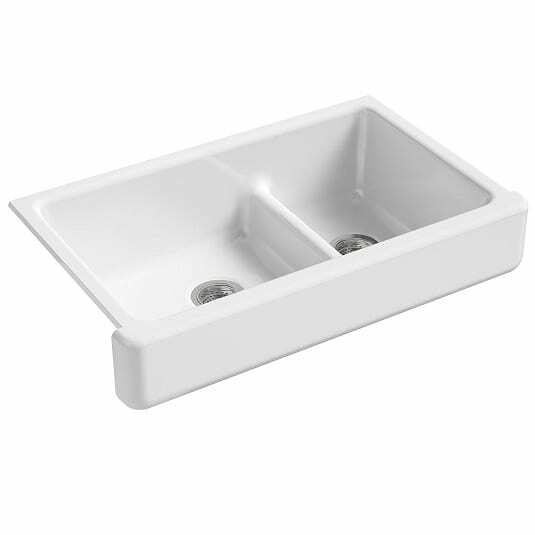 Size 33′ cast iron farmhouse sinks are popular because of the modern effect they bring into one’s kitchen. 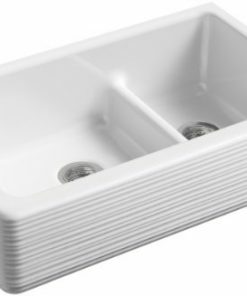 The sinks are charming with an intricately designed double or single bowl with a flat surface that acts as a working panel. 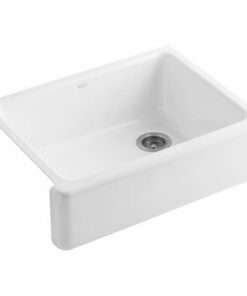 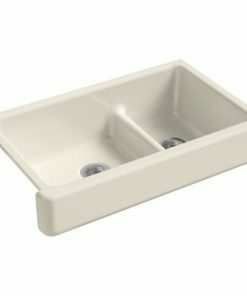 The size 33″ sinks also make installation very simple as the self trimming design can be under mount on an already existing base cabinet. 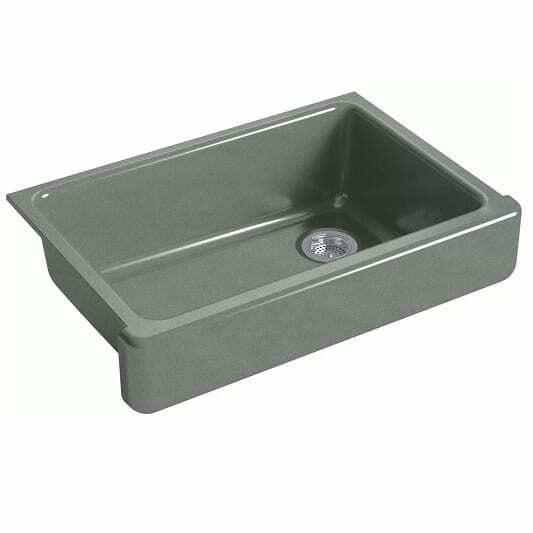 Size 36′ Size 36′ inch cast iron farm house sinks are not only large but also have very versatile features that enable easy installation. 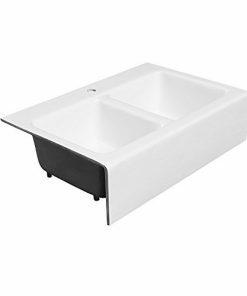 Larger sinks provide more than enough space for all kitchen functions, like rinsing utensils and storing of kitchen equipment. 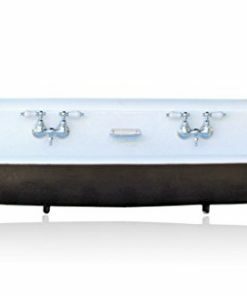 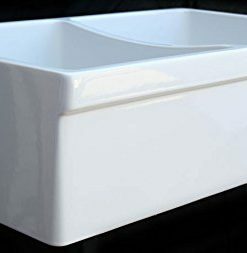 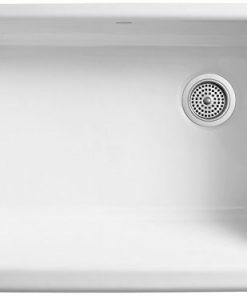 These large-sized sinks also have a drainage system with a sloped bottom that helps in getting rid of any accumulated water or dirt particles. Farmhouse sinks with cast iron material not only come in a range of styles but also colors that vary depending on one’s tastes and preferences. These sinks come in different colors such as white, brown, black, beige or almond that add an extra spark to the kitchen by giving it a more aesthetic effect. One has to therefore balance them off depending on the available kitchen equipment and the desired look. 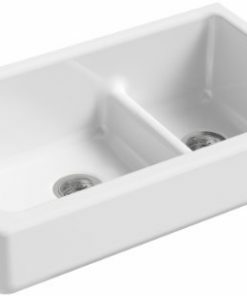 These not only give the sink an attractive and glossy appearance but also ensure that the whole kitchen acquires a perfect finish. Cast iron farm house sinks come in varying types from the double and single apron front cast iron to the double and single sinks. 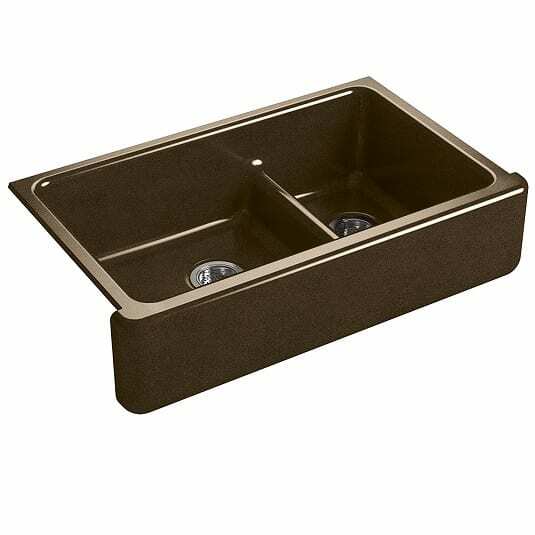 Double apron front sinks can match all kinds of kitchen decor as they have a double under mount and a self-trimming design and leave a lot of space for storage of kitchen appliances. 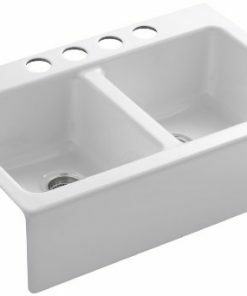 The single apron front sink has a lift out strainer and a flat apron surface that provides a comfortable and cozy working panel. 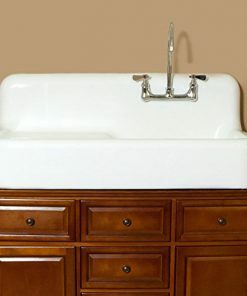 The single bowl can has an added advantage as it can be installed flush mount, under mount or built up. 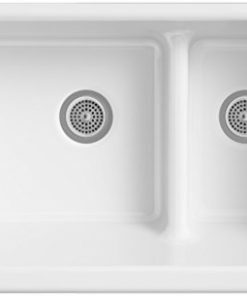 While single sinks come with only one large basin, double sinks come with an extra bowl that provides adequate space for rinsing and garbage disposal. 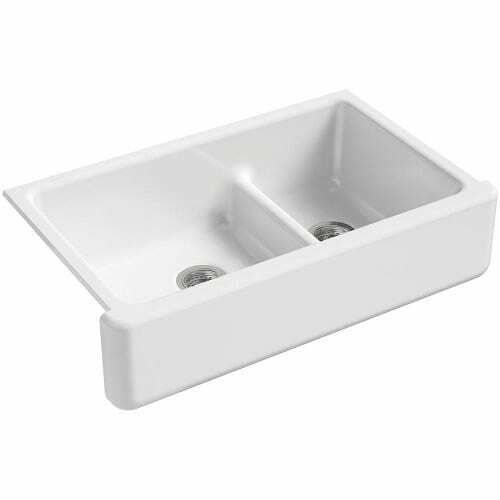 Cast iron farmhouse sinks come with added advantages and can never disappoint. 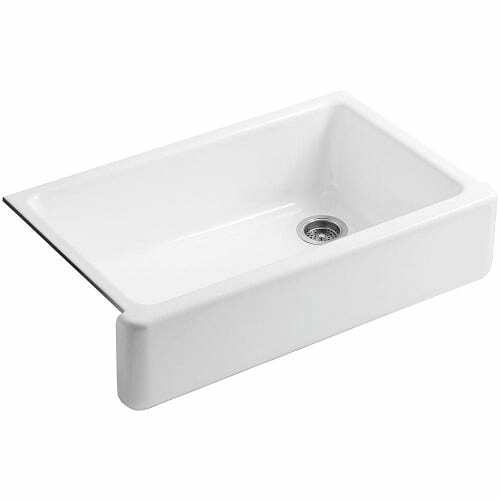 These sinks are very durable as cast iron is a very strong material susceptible to dents and cracks. 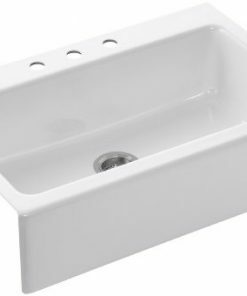 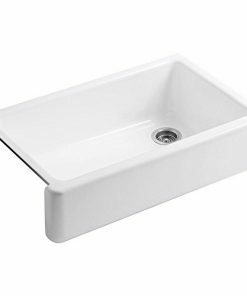 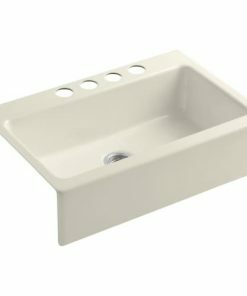 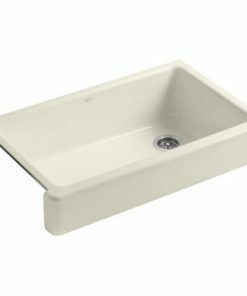 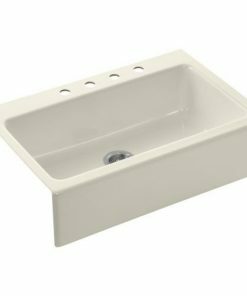 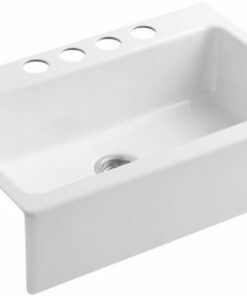 Cast iron sinks have a very smooth and porous surface that is easy to clean and maintain. Its glossy and attractive surface makes it easier to hide any water streaks that may be left on the surface. 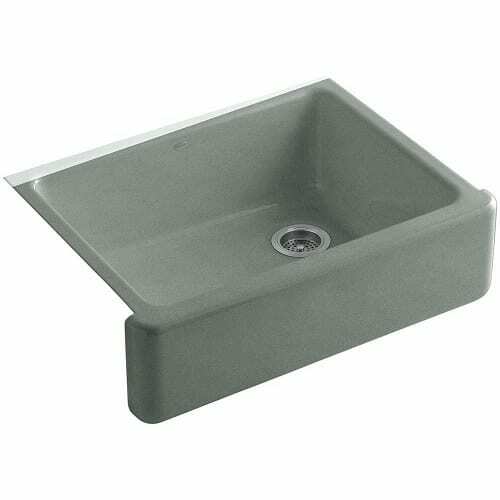 Cast iron apron-front sinks also have a very impressive finish that comes with a touch of different colors Its installation procedure is also very short and precise as it only involves an under mount of a self-trimmed design. 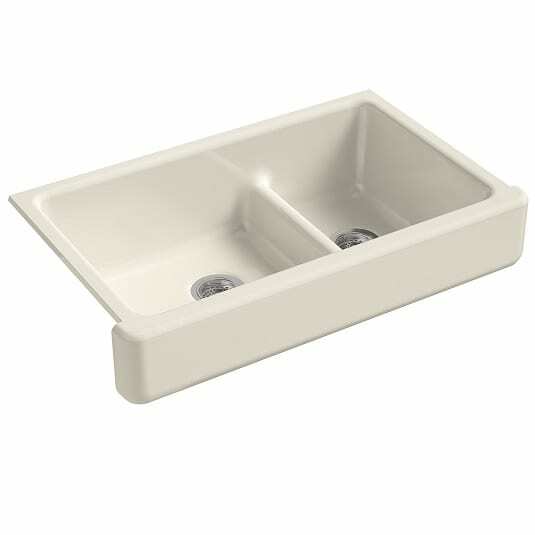 Farmhouse sinks are very convenient as they leave adequate room for storage of cooking ingredients, pans and pots. 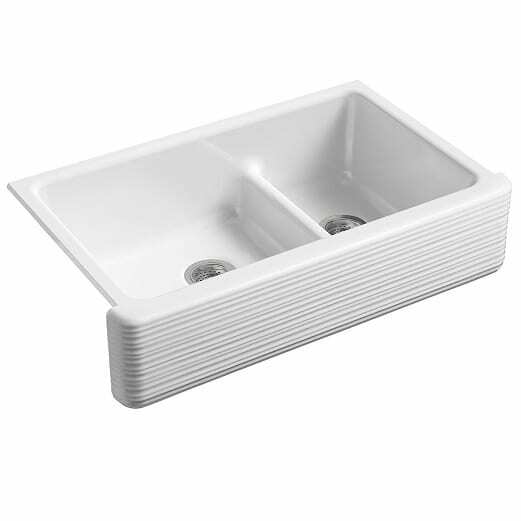 The sinks also have a very appealing finish and are very durable.